Faced with adversity, autism, a recent major back surgery, and several setbacks along the way, Reilly Phillip McMaster from Boy Scout Troop 64 of Cleveland dug deep and found the strength and courage to earn the rank of Eagle Scout just two days prior to his 18th birthday, the cut-off time allowed for a young man in Scouting to complete his Eagle Scout project and Board of Review. Reilly, the son to Phillip and Paulianne McMaster of Raleigh (pictured in photo), is a recent Alumni graduate with honors of Green Hope High School in Cary. Reilly is currently working an internship at Breci Entertainment. He also has a deep love and appreciation for our military and aspires to join the US Armed Forces in the future. In his free time, Reilly volunteers with the National Society of Military Missions in Action (MMIA) in Fuquay-Varina where they are dedicated to helping Veterans with disabilities, members of the Armed Forces, and their families. He also has a deep appreciation for our First Responders. For his Eagle Scout project Reilly built picnic tables and donated them to the Cleveland Fire Department. On Saturday, April 6th an Eagle Scout Court of Honor was held at The Pavilion at Carriage Farms in Raleigh. 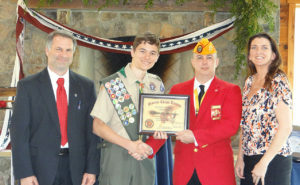 During his ceremony, Reilly was presented with the Eagle Scout Good Citizenship Award from Eagle Scout Coordinator Lewis W. Rice III (second from right) of the Johnston County Marine Corps League Carry-On Detachment 1236.